An exhibit opening at the Shelburne Museum this weekend proves you can take it with you. Some of it, anyway. American Wanderlust: Taking to the Road in the 20th Century is a paean to the countrys restless spirit. That is, the version that evolved with the automobile and the paved routes which allowed us to go west, and in every other direction, with the addictive assistance of fossil fuels. In the 20th century that pioneering sensibility headed toward its apotheosis  mobile homes that did not need to circle with other wagons against marauders at night but simply park alongside a handy hookup. It was the natural legacy of a citizenry that traveled from everywhere else to get here. And when the vestigial wanderlust merged with an equally potent, self-determined yearning for comfort and convenience, there was no question that the American pursuit of happiness would always, somehow, involve wheels. Such was our sense of adventure and, perhaps, entitlement, that even the most settled suburbanites wanted to have a veritable room of their own on the highway. Nomadism was simply a necessary way of life for others, explains Valerie Hunt, the Curator of Transportation at the Shelburne Museum and the dynamo behind American Wanderlust. That was particularly true during the Great Depression and the years immediately following both World Wars, when housing for returning soldiers was scarce, she informs. Then there were the original traveling salesmen. And the so-called Tin Can Tourists  impoverished campers who set up in the orange groves of Florida and California in the 20s and 30s  still exist today as a national touring club some 200,000 strong. Its northeast chapter, in fact, is headed up by State Representative Steve Hingtgen of Burlington. Hes got 25 tourists coming from as far as Michigan for opening weekend, says Hunt. It is predominantly the voluntary, recreational wheel deal that concerns the Shelburne Museum in this exhibit  the inventive motorized habitats and the attendant material culture documenting nearly a century of life in the lanes. Not least interesting is the intersection of modernist design and functional objects  an outcome of the machine age whose zeitgeist optimistically promised a bright, shiny and somehow better future. Anything that enhanced Americans freedom and individualism was unquestionably a good thing. Like, say, homes to go. Consequently, American Wanderlust offers up for interactive enjoyment more than a dozen touring vehicles of the 20th century, from a 1923 Auto Kamp Trailer to a 1970s pickup with a slide-on, along with other road, and roadside, memorabilia. The vintage vehicles are painstakingly restored right down to the curtains, including a 60s-era hippie bus. More on that later. Two more contemporary Cole-mans were outfitted by invited interior designers April Cornell and Orvis. And finally, there is a model for this century: a state-of-the-art, luxury Airstream Bambi prototype for 2003. No, you dont get to drive anything, though tiny pedal cars will be on hand for tots. As always at the Shelburne Museum, though, educational and entertainment opportunities abound  including video presentations and a large-scale floor board game that takes players on a pretend cross-country trip. Nosing through stationary vehicles may not quite match the adventure of packing one up and heading out with the Rand McNally, but American Wanderlust will provide what few vacations can manage these days: a journey back in time. People who love RVs prob-ably dont associate Miguel de Cervantes with their auto-obsession. But Valerie Hunt quoted the 17th-century Spanish writer  the road is always better than the inn  in an essay she wrote in December 2000 entitled, Prairie Schooner to Land Yacht: A Century of Americans on the Move. That essay marked the beginning of nearly two years of research  and enthusiastic acquisition  for American Wanderlust, only part of which were the rides collectively called recreational vehicles. The exhibit  budgeted in the $100,000 range  includes a 1956 Serro Scotty that Hunt shelled out for herself. She and two colleagues stayed in the rounded compact trailer for two days while scavenging at Brimfield  the giant antiques fair in Massachusetts. It was one of the best sources for artifacts, says Hunt, who delights in her serendipitous finds. Of immeasurable value, she adds, were the in-kind donations of stuff and labor in assembling the exhibit and restoring the vehicles. Hunt also attended a Tin Can Tourist meet in Michigan, through which she found her Scotty and a 1948 Branstrader trailer. Some vehicles were donated; one was found wasting away in a pasture. Known worldwide for its expansive holdings of American folk art and artifacts, the Shelburne Museum has edged closer to the contemporary with recent exhibits that have explored the playthings, art and living quarters of the mid-20th century  Hunt was also behind the creation of the museums 1950s House. The gradual modernization of the collections may be a logical move as the museum keeps pace with history, but it also reflects the interests of current president Hope Alswang. Shes really enlivened the museum, Hunt says approvingly. And, not coincidentally, the stuff of baby-boomer childhoods helps attract that sizeable demographic, and its offspring, to the museum experience. What has changed and what has stayed the same is of interest throughout this exhibit. But one thing you dont see on the road anymore is an all-out psychedelic hippie bus. The Shelburnes recreated version  from a 1948 White Super Power  may be uniquely popular with boomers, even those who never inhaled. If the tuned-in, dropped-out generation seems hopelessly naïve from where we stand, its easy to feel wistful about a time in which peace-love-and-happiness was considered feasible. Now that bus is gaily painted in the floral, paisley and faux-Indian designs of the period. Its interior décor precedes heavy metal  music, that is  with funky farm tables, junkyard appliances and macramé plant hangers. An authentic stash box is obscured under floorboards. I wanted to put a bong in it, confesses Hunt, but I got voted down. If the illicit substances are only implied, visitors can still dress like hippies  clothing and other vintage apparel will be on hand for playing dress-up. 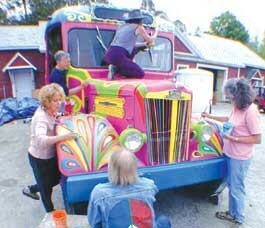 Keseys bus, made famous in Tom Wolfes 1968 The Electric Kool-Aid Acid Test, was called Furthur. As of a week ago, the Shelburnes bus was unnamed. But in keeping with the times  then and now  Hunt says they will probably call it Peace. Some things really never change. American Wanderlust will stay at the Shelburne Museum through October, in and around the Round Barn. After that the show will go  where else?  on the road.